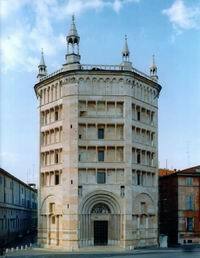 Parma is known for art, music, gastronomy and life's quality. It has 175.000 inhabitants and a large historical down-town that's expanded around "Piazza Grande", now named Garibaldi square. Parma appears before the tourist like an elegant, hospitable and unreserved city. The earliest traces of mankind in the area around Parma have been found on the quaternary fluvial terraces of the hills near Traversetolo, dating back to the Mousterian period of the Lower Paleolithic (100,000 - 35,000 yers ago). Upper Paleolithic sites (35,000 - 10,000 yars ago) have been found in the Taro and Ceno valleys. The main Neolithic settlements (4,500 BC) were in the lower-lying areas at Mamiano, Collecchio and Santa Margherita di Fidenza. 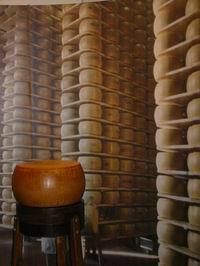 Eneolithic burial chambers (2,700 - 1,800 BC9) have also found at Collecchio. The Bronze Age saw the widespread use of terramara, from terra mara or terra marna: farming settlements on mounds of black, oily earth (or marl, a good fertilizer) forming quadrangular units enclosed by dikes and ditches linked to a waterway. The best examples of more than fifty that have been found are at Castione Marchesi, Borgo Valorio di Parma and Castellazzo di Fontanellato. Celtic occupation in the second half of the 4th century did not extend into the Apennine area, which was firmly controlled by Ligurian tribes until their supremacy was weakened by the crushing forces of the Roman army in the early 2nd century BC. The numerous prehistoric walled settlements, or castellieri, that have been found at Norciveglia on the slopes of Mt. Pelpi, d'Umbria and Rocchetta Metti (Bardi), Costa delle Case (Ponteceno) and Rocca Casali (Bore), provide a record of local defense systems. The Via Emilia, restored by Augustus, was the main artery of communications (remains of a Roman bridge where it passed over the Parma river and a Roman bridge over the Stirone at Fidenza survive), from which a series of major roads branched off. Parma occupied a strategic position at the intersection between the Roman road (running east - west) and the pre - Roman transapennine route connecting Luni and the Tyrrhenian Sea with the Po and the Adriatic. Two roads led to Tuscany and the Tyrrhenian Sea: Via Claudia - which later became the main Mt. Bardone road - and the Parma - Lucca highway, which ran up the Enza valley to the Pradarena (or Ospedalaccio) pass, down to the Lunigiana and Garfagnana regions, and from there to Lucca. Another important link was with Brixellum (present - day Brescello), a major river port on the Po where ships connecting Ravenna with Pavia and the Po valley changed crews. The city, which was renamed Crisopoli in the Byzantine period (553 - 568), was later conquered by the Longobards (569) and became a duchy ruled in 603 by a chamberlain who in turn was nominated by the king. A new communications system was laid over the Roman pattern, differing from it in some parts and coinciding with it in others. It was in this period that the Mt. Bardone road was created, the Parma stretch of the Via Francigena. The bishops gradually assumed temporal control and Parma took on a leading role in the investiture controversy. It took the side of the Holy Roman Empire in the dispute between the lay and ecclesiastical powers and produced two antipopes: Honorius II (ruled 1061 - 72), Bishop Cadalus, lord of the city and founder of its Cathedral, and Clement III (1080 - 1100), Bishop Guiberto. The establishment in 1106 of the Comune, or indipendent municipal authority, marked the rebirth of the city after its break - up in the early Middle Ages. The Peace Treaty of Constance (1183) was followed by a rekindling of disputes with the neighboring municipalities of Reggio, Piacenza and Cremona over control of the Po river, which was linked to Parma by the naviglio canal system. Power changed hands several times before Parma was eventually seized by the Visconti family in 1341, after which control passed to Philip Maria (1420) and - following a brief interlude of indipendence under the Terzi princedom (1404-09) - to the Sforza (1440-1500), which ruled the area through various noble families (Pallavicino, Rossi, Sanvitale and Da Correggio). Curiously, the feudal control exercised by these families in the area around Parma for centuries survives in some cases to the present day. Apart from the Landi family in the Apennine and foothill regions, the Fieschi family controlled Albareto (12th century-1547), Borgo Val di Taro (13th century-1547) and Calestano (until 1650), the Rossi family Corniglio (13th-17th century), the Pallavicino family ruled over Solignano (1249-1805) and Scipione (16th century-1776), and the Sanvitale family over Sala Baganza and Fontanellato (14th - 18thcentury). Down in the plain the Torelli family held Montechiarugolo (1406-1612),the Meli Lupi Soragna (dal XV secolo fino ad oggi), the Sanseverino Colorno (1458-1612), the Rossi family also controlled San Secondo(14th - 19th century). In 1545 Pope Paul III made the new political region of Parma and Piacenza over to his favorite son Pier Luigi Farnese in an attempt to create a buffer region between the Church State and Spanish power in Lombardy. It was the beginning of a dominion which, thanks also to the family's enormous wealth, lasted for two centuries. Pier Luigi moved the capital to Piacenza, but was assassinated in 1547 and the two cities were occupied in the emperor's name. Duke Ottavio successfully won back first Parma in 1550, and then Piacenza in 1556. Ottavio II (1547-86) did much to consolidate the state and limit the power of the nobles, and also carried out radical structural reforms to make the city worthy of its status as a capital. Duke Alessandro I put the governing powers into the hands of Ranuccio I (1592-1622), under whom the structure of the state was established. In 1594 the constitutions were drawn up by the powers of the Council of Justice; the university expanded and the College of Nobles was founded. The war against the petty feudatories continued, culminating in 1612 in the execution in Parma's main square of Barbara Sanseverino and six other nobles accused of conspiring against the Duke. After taking control of the domains of the Pallavicino family in 1588 and those of the Landi family in 1682, the House of Farnese had taken over the entire Parma region by the end of the 17th century. One of the projects begun under their rule was the radical transformation by Ferdinando Bibiena of the Sanseverino family's castle in Colorno, which became a sumptuous residence. With the death of Antonio in 1731 the Farnese family died out and Parma fell into decline. The rightful heir to the duchy was the spanish infante Carlo, son of Elizabeth Farnese and Philip V. After setting up court in Naples in 1734, Carlo transferred most of his mother's wealth to the Royal Palace there, completely stripping Parma of the fabulous art collections in the ducal palaces of Parma, Colorno and Sala Baganza. When peace was signed at Aix-la-Chapelle in 1748, Charles I's brother Philip, who went on marry Louis XV's daughter Louise ELizabeth, became duke of Parma, Piacenza and Guastalla, adding much of the Reggio plain to the duchy's possessions. Thus Spanish influence gave way to French control. Parma subsequently enjoyed its period of greatest splendor, with new elegant neoclassical architecture, urban structures and important institutions, such as the Biblioteca Palatina (a library), the Royal Printing, works run by Giambattista Bodoni, a rudimentary Museo Archeologico (displaying finds from excavations at Velleia), the Quadreria, (picture gallery) and the Botanical Gardens. Tillot's policies continued up to the time of Napoleon (1802-14), when the new Taro departement was created. The Congress of Vienna in 1815 awarded the duchy to Marie-Louise of Austria, the second wife of Napoleon Bonaparte (1815-47). During her absolutist rule from 1816 to 1847, with the aid of ministers brought in from other countries, the city grew further, welfare structures and public works were developed and improved on, architecture programs were implemented and communications improved with the creation of the main Parma-La Spezia road. 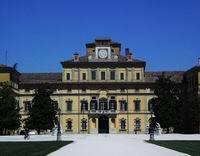 The ducal residences were also modernized: extensions were made to the Hunting lodge in Sala Baganza, the Ducal Gardens, in Colorno the Ducal Garden in Parma opened to the public. The popularity of Parma's "beloved sovereign" was such that the duchy felt little if anything of the moves toward unification in the early years of the italian Risorgimento. In 1847 Marie-Louise died, and the duchy was returned to the Bourbons, whose last ruler Charles III was stabbed yo death in the city in 1854, leaving a widow Luisa Maria Berry. The protest and violent strikes in the years that followed culminated in the general farm workers' strike from 1 May to 25 June 1908. Opposition to Fascism came to a dramatic head in early August 1922, when Italo Balbo tried to enter Parma's working-class Oltretorrente district. The Cathedral: dedicated to the Virgin Mary, can be considered one of the finest examples of Romanesque architecture in Italy. It was erected by the heretic bishop Cadalus, who later became antipope Honorius II. Destroyed by an earthquake in 1117, it was rebuilt and completed in the 12th century. The tall bell tower, topped by a gilt copper angel, was added in the following century and the side chapels during the 14th and 15th century. The great void of the dome was frescoed by Correggio in 1526 with the Assumption of the Virgin. Pilotta Palace: this vast but unfinished complex was built in the second half of the 17th century at the order of Ranuccio I around the Visconti stronghold and alongside the existing church of San Pietro martire. It hosts some of the most important insitutions of the city: Palatina Library, Archaeological Museum, National Gallery, Farnese Theatre, University of Parma, Art institute, offices of the national Art and cultural Heritage. Emilian cooking can boast a highly refined variety inherited from the ducal courts as well as local popular dishes. Parma has given its name to several highly prized diary and meat products, the prince of which is undeniably the Parmigiano Reggiano. This highly nutritious product is the result of a long and carefully controlled process of natural maturation, and comes in a huge shape, round blocks weighing between 24 and 34 kilos, branded with the regional symbol of quality. A close second to Parmesan cheese, come the local salamis and cured meats. Gastronomic specialties in this field of production include Culatello of Zibello, the so-called Spalla from San Secondo, Coppa di Parma, Salami from Felino and the world-famous Prosciutto di Parma, or Parma ham. To accompany the meal there are wines of high quality, all with the D.O.C. certificate: the red Colli di Parma, and the white Malvasia and Sauvignon, red Lambrusco and the vivacious red Fortana.